After becoming independent from a corrupt and struggling cooperative, this farmer group took to learning about coffee by themselves, building a close-knit community with passion, dedication and pride in their coffee. Heavy and sweet aromas like black tea and spices. Sweet and soft taste like plums and blackcurrant. Soft body like vanilla and chocolate. When asking around about this coffee from Tanzania, an origin I was very much interested in, people kept telling me it was too primitive and only just specialty grade. Then I met Rebecca Trupin as an Aranga representative at World Of Coffee 2018 in Amsterdam, and I was amazed by her enthusiasm and energy. With such a mindset, I felt that no one should give up on this coffee that had so much complexity and sweetness to it already, despite lacking in body and clarity. 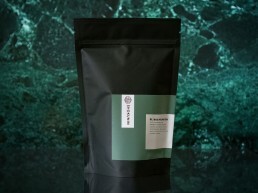 Even though this quality does not exactly meet the quality standards that Shokunin adheres to, it is definitely a coffee worth investing in, since we expect it to reach high specialty grade within a couple of years. This, we can achieve by buying the coffee at premium prices now in order to make the proper investments. The Aranga group was originally formed by 10 members who wanted to become independent from a mismanaged cooperative. They shared a vision that quality coffee is more sustainable and more rewarding and put this in a democratic jacket. Because of this, they were open to feedback and communication; this has led to 50% higher prices after 3 years of working together. Their collective approach is not like any other cooperative: ever since their start in 2002, they have held weekly meetings with their members, made decisions collectively and got a local agronomist involved. The project grew steadily and currently the cooperative has 28 members. Generally, each member has 0.2 – 2 acres of land, which the coffee plants share with mostly banana trees. Rebecca Trupin is our main contact person for this cooperative. This half-Tanzanian, half-American energetic yet modest woman met the Aranga group in 2012. She met Lennart of This Side Up in 2014; he gave advice on contracts and shipping, assuming she would be exporting to the United States. However, the 2015 was so good that Lennart decided to get this coffee to Europe after all. Reduced collective drying from 12 locations to 4 in order to stabilize drying; introduced moisture meters. New partnership with agronomist and worked on communication channels between the cooperative and exporters. Met at World Of Coffee and discussed plans and feedback over Whatsapp for months after. This feedback loop that included examples and knowledge from all around the world gave new perspectives on processing and ways to get farmers enthusiastic about quality. Shared pictures of farms’ cherry selections in other origins to clarify the quality we’re looking for. Rebecca will try to get these framed and to hang them in the collective spaces to increase awareness. We are developing a quality premium project that should give farmers a proper reward for an increase in quality. We are currently finding out to what extent cherry selections can be separated and which quantities would be worth processing separately. 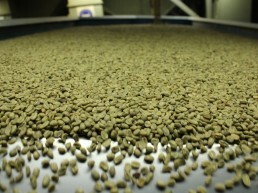 Then, we will be able to make quality distinctions and develop different price levels. Separation of quality lots might also mean separation of cooperative members’ lots. If possible, this is something we want to use in order to enhance awareness but especially pride for their product. We’re trying to standardize the coffee processing. Four centralized processing stations have been built, rather than having every family process their own coffee. Now, we are trying to get these four stations aligned and to train them in accurate processing. By supporting Aranga, you support a wide range of families that earn a living through this cooperative. You also show that by selecting the right partners and putting effort into coffees with potential, new qualities can be achieved. It’s easy to follow prejudice and simply buy what tastes special, but it’s ever so much more rewarding to help other people reach this level of quality as well. There’s plenty of farmers who share this group’s mindset and who are willing to join; creating the demand for this coffee makes this possible. Fully washed. Double wet fermentation (2 x 18hrs), first shade dried, then sundried on raised beds.